Today, Modern Consumers is reviewing an all-natural, organic tea: CogniTea. This IndieGoGo project is a tea with unique blends, natural herbs and L-Theanine ( a green tea extract). CogniTea claims to give you mental clarity, keep you focused and re-energized throughout the day. Modern Consumers tested it for you! Read on to see what we think of this IndieGoGo tea-project. First of all, let’s talk about the taste. The flavor is “herbal peppermint” with undertones of green and black tea. While some of our Modern Consumers team members are not keen on the taste of peppermint, we were surprised it didn’t have that overwhelming typical bitter taste. The smell is very strong, but the taste is sweeter than regular peppermint teas. The fact that the taste is not that strong, is because the bitterness is being compensated with many other flavors like: Guayusa Leaf, Yurba Mate Leaf, Assam Black Tea Leaf, Ginkgo Biloba and some others. In our opinion, it’s a tea that most of the people will like. Taste approved! Now let’s talk about what CogniTea claims to do: give you mental clarity and keeps you focused. While many of us rely on just caffeine ( and lots of it!) to keep us going, CogniTea combines the benefits of caffeine with natural ingredients, which we mentioned before, so you have the best of both worlds. While one cup of this herbal tea in the morning obviously won’t keep you focused the entire day, it can surely help you to give that extra boost in the afternoon when all your energy seems to be gone. So in overall: don’t be scared to try the CogniTea peppermint teas! The taste is approved, even for those who dislike peppermint. And if you need that extra bit of energy to start the morning or to end the day, then CogniTea is your cup of tea! 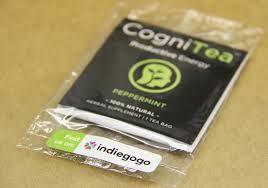 For more information, click here to visit CogniTea’s IndieGoGo’s page and to sponsor them.